The Critical Linkage concept is key to ensuring that comprehensive plans remain focused on the future. The citizens of Florida have a unique chance to create a model wildlife corridor from the Chassahowitzka National Wildlife Refuge in Citrus County to the Suncoast Seabird Sanctuary in Pasco County. At the Gulf Coast Conservancy, we call this the Nature Coast Greenway and Wildlife Corridor. natural environment where humans and wildlife can live in harmony. Acquisition and preservation of the properties which comprise the Nature Coast Greenway and Wildlife Corridor are underway, but there is still much work to be done. Many of the parcels needed to complete the project are still at risk. Acquisition of these sensitive natural areas is our number one priority. The land already acquired also needs our attention. The agencies charged with managing these precious assets are developing their management plans which will determine the mix of public use and environmental protection. Our continuous involvement will be instrumental in helping to assure that a reasonable balance is achieved. The Hernando County Administrator is promoting a "concept" to create an aquatic park playground and public meeting venue, disingenuously disguised as a Nature Center, within the boundaries of the Weeki Wachee Preserve. The concept, as presented to the public, is fatally flawed, suffering from a misunderstanding of the fundamental and mutually incompatible differences between a Park and a Preserve. Because of this fatal flaw, the Gulf Coast Conservancy opposes this intrusion of disruptive public activity into the preserve. Speak out now. Please contact the Hernando BOCC and ask them to seek other location options for public park amenities that are not in fundamental conflict with the science-based Preserve Management Plan. The plan can be viewed on the SWFWMD website. You can comment online via the project survey conducted by the county. Simply stated, Parks are for People while Preserves are for Nature. At two public meeting to introduce the “concept”, public response was overwhelmingly negative, approaching 90% disapproval as reported by local newspapers. Nonetheless, Hernando County staff has forged ahead and the BOCC has scheduled a vote for July 8th. Bluntly put, Hernando County staff proposes to build a public venue on land it does not own, in violation of the regulations concerning the use of that land, using money it does not have without violating the proposal under which state tax dollars were acquired, that has almost no public support, with no consideration of ongoing costs, unaddressed safety and liability issues and whose primary justification is that people want more access to Gulf beaches, which the “concept” does not provide. Any reading of the history leading to the acquisition of the land that makes up the core of the Preserve shows that the clear intent of the laws that provided Preserve funding envisioned only limited low-impact public access. The Management Plan lists specific activities that allow appreciation of natural ecosystems with an absolute minimum disruption to the environment. The "concept" presented by the County Administrator ignores the guidance provided by the Plan and ignores the laws that allowed state funds to be used to acquire the Preserve, and does great harm to the fundamental principles of preserving natural systems and protecting water quality that underlie SWFWMDs's existence. Click here to read our position paper in its entirety. It was September, 2006 when the GCC first learned that the SunWest mine property was to be developed. 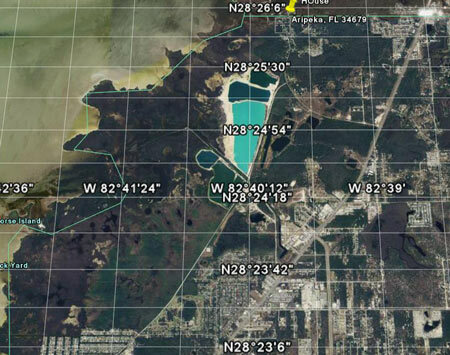 Since this property had been promised by the mining agreement to be returned to Pasco County for “recreation and conservation,” we were appalled to hear that a 2500 home subdivision and commercial center were to be built across 1000 acres of core black bear habitat. Initially, we were the only ones to step up to the plate and oppose SunWest. This environmentally destructive project require three major changes in laws and ordinances to be approved, and the GCC set out to do all we could to derail this misuse of lands promised to the public. In baseball terms, we had three swings before being put out. Google Earth shows the mine property nestled in core black bear habitat. Strike two. 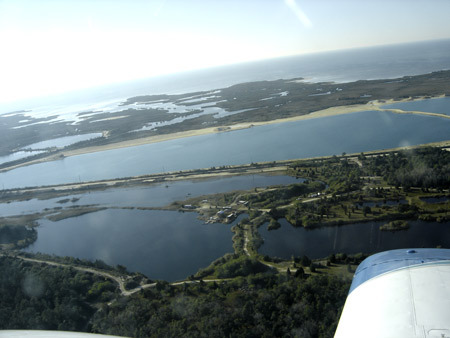 Despite intensive conversations with multiple agencies all the way up to DCA in Tallahassee, Pasco County gained approval, over voluminous protests, to changes to the County Comprehensive Plan that allowed, among other things, Pasco to spend county funds for the benefit of a private company, allowed construction in the Coastal High Hazard Zone without adequate evacuation provisions, and placed the counties Flood Insurance discount at risk. All 5 commissioners voted in favor of this. Looking West toward across the large lake to the Gulf. The strip of sand at the back of the lake is where they propose to put the big dollar homes, clearly a Coastal High Hazard Zone. For reference, see the Google Earth image above. This photo is taken at the N28°-24'-54" line. ACOE’s original response to the permit application was a mild request for more information. This was met with a non-response prepared for the County by the developer. A back and forth dialogue over the next five years became increasingly acrimonious, with ACOE asking for changes and the county refusing to agree and arguing bad faith. On May 10th, 2013, the Army Corps of Engineers finally ran out of patience and denied the permit with prejudice. You can read their 140 plus page justification on the Corps' website. As the Corps proved in detail in its rejection of this ill-conceived and environmentally disastrous dredge proposal, the dredge was never in the public interest. Thanks are due to the 14 environmental groups and 40,000 citizens who wrote, called or signed petitions against this boondoggle. Congratulations are due to the Army Corps. Its analysts withstood pressure from local, Federal and State officials and were able to separate the truth from the bovine biomass spewed by SunWest advocates, among them Pasco Commissioner Jack Mariano. A special thanks to two concerned citizens who decline to be named, but whose efforts were instrumental in gathering data that played a significant role in proving that the County’s propaganda minimizing the amount of environmental damage that would be done were the dredge was simply wrong. But, as Yogi Berra famously said, “it ain't over till it’s over.” Pasco County has 60 days to appeal. Commissioner Mariano has been quoted as desiring to revisit the dredge at a future date. After 5 years of lobbying, calling in political favors, begging and threatening, the BOCC should realize that this dog won’t hunt. 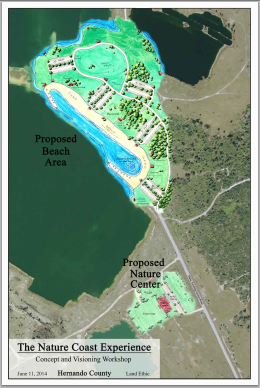 The Gulf Coast Conservancy hopes the BOCC will recognize that the citizens of Pasco deserve and can have a park suited to its location, designed to accommodate the real people of the area, and not aimed to please prospective occupants of a yet to be built subdivision. Cut ties with SunWest Acquisitions. Forget the dredge. Change the name back to Belcher Park, as it appeared on 1990’s map, in honor of the man who fulfilled his promise and donated the mined out land back to the county. Keep Old Dixie Highway open from Aripeka to Hudson to allow additional access to the park. Build the boat ramps and paddle craft launch area and a smaller parking lot. Build the swimming area in the lake. Build a walking/bike rail around the lake. Open the park ASAP. We’ll be watching to see how this plays out. You should too! May 2010 – After two and a half years of legal wrangling, in which the GCC participated in opposition to the development, the Department of Community Affairs has removed its objections to the proposed development near the intersection of Shady Hills Road and the Suncoast Parkway. The crucial legal issue hinged on whether the description of the critical linkage wildlife corridors as published in the Comprehensive Plan was sufficient to detail the actual location on the ground. Another factor in DCA’s decision was the failure of Pasco County’s commissioners to enact a wildlife protection ordinance including these linkages. A little history is required to understand the legal position. Please read the background on the issue below, and let's not let history repeat itself. Ask the County Commission to prevent future damage to the critical linkages in Pasco County. Ten years after the County agreed to enact it, Pacso's Critical Linkage Wildlife Protection Ordinance has still not been finalized and enacted. In 1999, Citizens for Sanity, Inc. sues Pasco County over wildlife protection deficiencies in the Comprehensive plan. In 2000, Pasco County agrees, as part of settlement, to the “establishment of a wildlife ordinance and for the establishment of wild life corridors to connect the major well fields.” Action to institute this ordinance was to start within 45 days. In 2002, Pasco Count accepts Assessment of Measures to Protect Wildlife Habitat in Pasco County, a study prepared by consulting firm Glatting, Jackson et al that defines critical linkage wildlife corridors between the undeveloped well fields in the county. In 2006, Pasco County references, but does not define, these critical linkage wildlife corridors in revisions to the Comprehensive Plan. Note here that 4 years have passed since the county agreed to enact a wildlife protection ordinance and the ordinance is not yet even drafted. In January 2008, Bell Fruit/Zelenda Partners applies for development of property east of Suncoast Parkway and north of Quail Hollow subdivision. The proposed development intrudes into the North Pasco to Starkey critical linkage wildlife corridor. County Staff recommends approval with conditions. The developer rejects conditions and threatens to sue under Burt Harris. In March 2008, BOCC sends modified agreement to DCA for approval. In May 2008, DCA sends the Objections, Recommendations and Comments (ORC) report to the county that rejects development plan, citing, among other things, Environmental Suitability (failure to protect critical linkage wildlife corridors) as reason. In July 2008, the first draft of the critical linkage wildlife protection ordinance is published, 6 years late. On September 6, 2008 Staff submits a re-worked development plan to County Commission. County Staff believes that disagreements have been worked out and recommends approval based on conditions that protect the integrity of the wildlife corridor. Staff’s recommendation is placed on the county website to be used by interested parties to evaluate the proposed development. On the Friday afternoon before an unusual Monday meeting of the BOCC, attorney for the developer submits revisions to the agenda item. At the BOCC meeting, Staff objects that they have not had time to review the changes. Over repeated objections by the County Administrator, County Attorney, and County Growth Management Director, Commissioner Mulieri insists that development proposal be considered with the last minute changes included. She states that the developer is a friend and he has waited long enough to get permission to develop his land. The rest of the BOCC concurs without comment and the development proposal passes unanimously. In October 2008 GCC writes DCA to protest development plan. In November 2008 DCA sues Pasco County in Administrative Court. GCC signs on as intervenor. August 2009 sees a revised draft of the critical linkage wildlife protection ordinance published. After objections by Commissioner Cox, provisions that allow County Commissioners to reduce the width and change location of the corridors are inserted in the ordinance. Between December 2008 and April 2010, negotiations between DCA and GCC on one side versus Pasco County and developer on the other continue. Developer’s lawyers convince DCA lawyers that, since the wildlife protection ordinance defining the critical linkages has not been implemented, the critical linkages as defined in the Comp Plan are vague and unenforceable, and therefore not binding on this development. May 2010: A settlement agreement between DCA and Pasco County is reached that in effect allows the developer to build within the critical linkage boundaries. GCC is left with only the option of proceeding with a lawsuit against DCA, Pasco County and the developer. Sadly our resources do not permit this, and we reluctantly agree to the settlement. Study our issues, read the reports and factsheets. For more detail, visit our Advocacy Resources page. The Conservancy can use your help. To support our efforts, please consider membership. We can then keep you up to date on important events and actions. Right now, the single most important thing anyone interested in preserving land from future development is to assist the Florida Forever Coalition in their efforts to place a constitutional amendment called the Florida Water and Land Conservation Amendment on the 2014 election ballot. This amendment would require that Florida Forever, which has been the primary funding source for purchasing land for preservation, be fully funded every year. At present, annual funding is subject to legislative and gubernatorial whim. After two years with no funding, a small amount has been earmarked in this year’s budget. The amendment would require funding of Florida Forever using funds generated by documentary stamps on real estate transactions. To get the amendment on the ballot for 2014, 676,811 registered voters need to sign the petition. See how you can help at the Florida's Water and Land Legacy website. 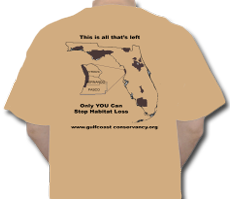 Express your desire to protect Natural Florida by preserving habitat. A limited edition of this design. Available in S,M, L, XL and 2XL. Black design on tan shirt. Price is $10.00 + $3.00 shipping (USPS). As always, free to new members. Click on the photos above to see the design full size!